The amount of 1.26 USD has been deposited to your Perfect Money account. Accounts: U12111925->U6399089. Memo: API Payment. Partner award from P35153678 Money-in.Space.. Date: 14:11 09.01.17. Batch: 159699188. The amount of 0.6 USD has been deposited to your Perfect Money account. Accounts: U12111925->U6399089. Memo: API Payment. 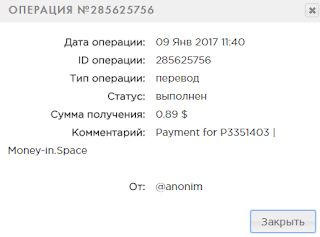 Payment for U6399089 Money-in.Space.. Date: 14:55 09.01.17. Batch: 159704001. The amount of 0.6 USD has been deposited to your Perfect Money account. Accounts: U12111925->U6399089. Memo: API Payment. Payment for U6399089 Money-in.Space.. Date: 14:56 10.01.17. Batch: 159812312. The amount of 0.6 USD has been deposited to your Perfect Money account. Accounts: U12111925->U6399089. Memo: API Payment. 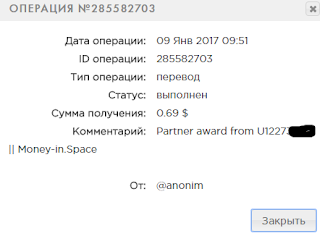 Payment for U6399089 Money-in.Space.. Date: 14:57 11.01.17. Batch: 159922519. The amount of 0.35 USD has been deposited to your Perfect Money account. Accounts: U12111925->U6399089. Memo: API Payment. Partner award from P52899567 Money-in.Space.. Date: 18:08 11.01.17. Batch: 159942514.